A body in the fire-based crematory oven of Lakewood Cemetery. George Alan Thompson II, known as Big Al or the Fish Man, son of Columbus, Ohio, resident of Kennesaw, Ga., onetime bartender, restaurant manager, real estate agent, motorcyclist, owner of aquarium-maintenance business Aquaholics and noted jokester, died May 28, 2010, at age 50. He is now a reef. Big Al sits at the bottom of the ocean 1½ miles (2.4 km) off Pensacola Beach, Florida. Fish swim through him. Corals will soon grow on him. So will soft sponges--but not yet. After all, Big Al's new life as a reef is still in its infancy. It was three years ago, on Memorial Day weekend, when a drunk driver hit Big Al on his way home while he was riding his favorite bike, a customized Ultra Classic Harley-Davidson. But Big Al wasn't just a biker. More than anything, he was a fish nut. "At one point, we had 25 aquariums in one room," says his widow Susan. "He was obsessive." So when the Fish Man, as friends often called Big Al, heard about Eternal Reefs, a Decatur, Ga., company that places cremated remains on the ocean floor, he was sold. This was something living, something eco-friendly and nothing like a traditional burial. In 1998, the year Eternal Reefs began placing ashes in the ocean, only 24% of Americans chose cremation over burial. But the business came along at a perfect time in a changing industry. In 2011, the U.S. cremation rate hit 42.2%, according to the most recent numbers compiled by the Cremation Association of North America (CANA), based on death-certificate information provided by states. The growth is partly driven by the Great Recession and Americans' newfound desire for low-cost anything--including how we dispose of our bodies. Several states already have cremation rates above 70%, and CANA projects that if current growth rates continue, 1 out of 2 Americans will choose flames over dirt by 2017. Death in the U.S. is a $13.4 billion industry. Cremation accounts for about 20% of that number--a percentage that belies the full extent of its popularity, simply because cremation is so much cheaper than burial. 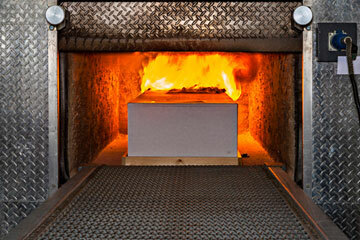 Being cremated costs about a third of a typical casket burial. And while price has been a big driver behind cremation's recent growth, our increasing desire to cremate also speaks to our ever-more-mobile society, our gradual shift away from religion, our views about the environment and even our changing notions of our physical bodies. Historically considered to be as stiff and stubborn as its clients, the funeral-home industry is only now beginning to offer what we seem to be longing for in death as in life: meaning, engagement, convenience and personalization. Reefs are merely the surface when it comes to options for "cremains," the ash left behind from a cremation. The quirky and booming merchandise business includes the following: cremains that can be exploded as fireworks, cremains used as paint in artwork, cremains stored inside jewelry, cremains unloaded from shotgun shells, cremains pressed into vinyl records--not to mention countless customizable urns. Couch potatoes can reside in an urn that features a remote control. New York Yankees fans can have a baseball-themed one.